Sadly, according to Sea Shepherd, the calf’s mother may have already died. “There is widespread speculation that the mother of the albino calf committed suicide after her baby was violently taken from her. To support of the organizations on the ground working around the clock to bring awareness to this year’s hunt, the Internet has started rallying around such symbols as Angel. 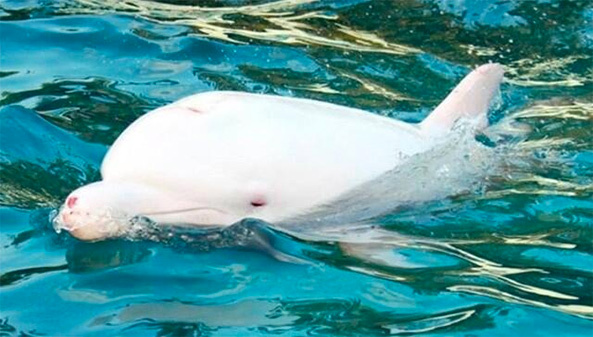 A Facebook page titled “The Angel of Taiji” has soared from some 250 likes yesterday to more than 2,200 today. The international “hacktivist” group Anonymous also rallied to briefly take down the webpage for Wakayama Prefecture, where Taiji is located and the site for the Japanese Aquarium. People are even creating picture montages set to music, as seen in this recently-added YouTube video. And yes – the petitions have also started, with one focused on Angel already receiving more than 26,000 signatures. Want to help? Beyond supporting the groups listed above, here are some contacts courtesy of Ric O’Barry’s site to reach out to and express your feelings on the hunt.